Nintendo’s recently-announced classic games service will eventually bring your favorite 8-bit and 16-bit titles to the Switch. And when it finally launches, 8Bitdo’s new SNES30 Pro controller looks like it could be the perfect way to play everything from the original NES’ Super Mario Bros., to the Switch’s Zelda: Breath of the Wild. Based on the curvy design of the Super Nintendo controller, the SNES30 Pro has the familiar directional pad on its left side, with Y, X, B, and A buttons on the right. 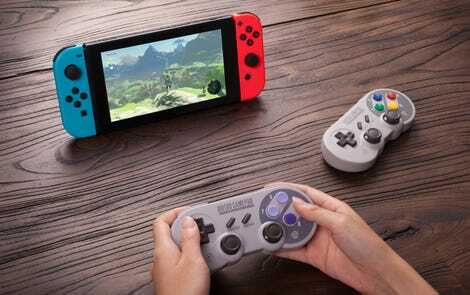 But it adds a pair of analog joysticks to the mix, positioned similar to where you’d find them on the PlayStation’s DualShock controller, as well as additional shoulder buttons to match what the Switch’s Joy-Con controllers can do, and a USB-C charging port. The SNES30 Pro also rumbles, and has a gyroscope inside so it can be used with motion-controlled features in games, such as aiming the bow and arrow in Breath of the Wild. It’s not Switch-only, however. Using Bluetooth you can connect it to Windows PCs, Macs, and Android mobile devices. Has 16 years been long enough for Microsoft fans to feel similarly nostalgic for the original Xbox’s gigantic controllers? We now have all the details about this new console, which is officially the fastest console built to date. That bizarre warping effect of the fidget spinner in motion is a result of the rolling electronic shutter on the smartphone camera being used.